TORONTO (AP) — Maple Leafs coach Mike Babcock expected William Nylander to be "the freshest guy in hockey" on Thursday night. That was probably asking too much of a player making his season debut with exactly zero practice time since ending a prolonged contract impasse with Toronto just last weekend. The rest of Babcock's team, which eventually showed signs life after a poor opening 40 minutes, didn't really have an excuse. 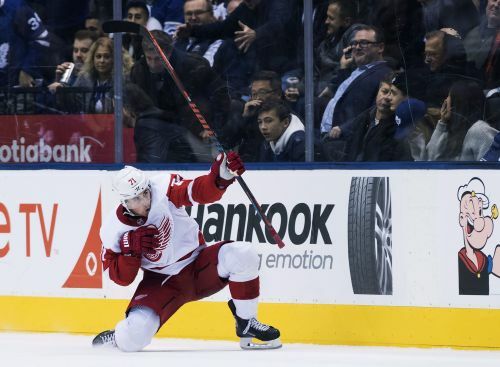 Dylan Larkin scored at 2:48 of overtime and the Detroit Red Wings survived a blown three-goal lead in the third period to beat the Maple Leafs 5-4 and snap Toronto's five-game winning streak. "They were just better than us," Babcock said. "They played harder." Nylander agreed to a six-year, $45 million deal minutes before Saturday's deadline for the restricted free agent to be eligible to play in the NHL this season. He flew to Toronto on Sunday from Sweden, where he had been practicing with a junior team, twice went through drills with a Leafs assistant coach and took part in Thursday's brief morning skate. Coming off consecutive 61-point seasons, the 22-year-old finished with 12 minutes, 29 seconds of ice time, but didn't see any action in the final 14:35. "It has nothing to do with Willy, it has to do with me and trying to win the game," Babcock said of the benching. "Any time you've missed that amount of hockey, it's going to be hard." Nylander, who got a mostly warm reception when he stepped on the ice for his first shift, started on a line with Auston Matthews and Patrick Marleau before sitting. "It felt OK," Nylander said. "There's a lot of differences from practicing by yourself." After the Leafs stormed back with three goals in under nine minutes in the third to tie it, Larkin moved in on a breakaway in the extra period off a pass over the top from Gustav Nyquist, and beat Garret Sparks on a deke. "We were better than them for two periods," Detroit head coach Jeff Blashill said. "Our guys battled extremely hard and (I'm) proud of the way that they played." Nyquist finished a goal and two assists. Mike Green had a goal and an assist, Jonathan Ericsson and Luke Glendening also scored, Larkin had an assist and former Maple Leafs goalie Jonathan Bernier stopped 27 shots. Andreas Johnsson and Kasperi Kapanen had a goal and an assist each for Toronto. John Tavares and Zach Hyman also scored, and Sparks made 27 saves. Tavares made it 4-2 when he ripped his 18th past Bernier off the rush at 2:38 of the third. Hyman added his seventh on a rebound at 8:50, and Johnsson tied it with his sixth with 12:24 to go. NOTES: Members of the Humbolt Broncos and their families were in attendance. ... Detroit defenseman Niklas Kronwall played his 900th NHL game. Red Wings: Host New York Islanders on Saturday night.